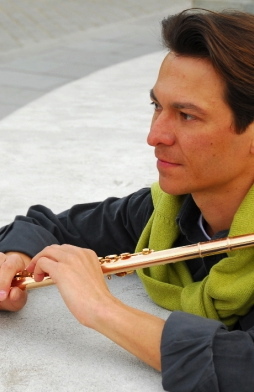 Günter Voglmayr, flute, was born in Ried/Innkreis on February 21, 1968, and obtained his first private flute instruction at the age of eight. As of 1978, he continued his training with Helmut Trawöger at the music school in Grieskirchen and four year later he was accepted into the class of Wolfgang Schulz at the Vienna College of Music. Günter Vogelmayr, who was the prize winner in 1981 and 1985 at the Austrian national competition “Jugend musiziert” in Leoben as well as at Eurovision’s “International EBU Competition for Young Musicians” in Copenhagen, performed as first flutist with the Gustav Mahler Youth Orchestra in 1987 under the batons of Claudio Abbado and Franz Welser-Möst and in that same year was engaged in the Stage Orchestra of the Vienna State Opera. Following a successful audition he became a flutist with the Vienna State Opera Orchestra on September 1, 1993, and became a member of the Vienna Philharmonic on December 1, 1996, while in the meantime having completed his studies, augmented by courses with Aurèle Nicolet, with a diploma in 1994. During his entire artistic career, Günter Voglmayr worked intensively as a soloist and chamber musician. He made numerous appearances with the Vienna and Zurich Chamber Orchestras, the Vienna Chamber Philharmonic, the Stockholm Sinfonietta, the Haydn Trio Vienna, the Vienna Ring Ensemble and the Weinmeister Trio. He also worked with the pianists Pierre-Laurent Aimard, Alexander Lonquich and Stefan Mendl, and with the soprano Christiane Oelze. All of this is documented in numerous CD, radio and television recordings made at home and abroad (Europe, America, Japan and Korea). In 1997 he founded the “Klangburg Festival Rappottenstien” and remained its artistic director until 2004. In 2003 he was diagnosed with a serious illness. Following his recovery, he resumed his artistic endeavours at the highest level until 2010, when the illness returned and to which he succumbed at the age of 43.